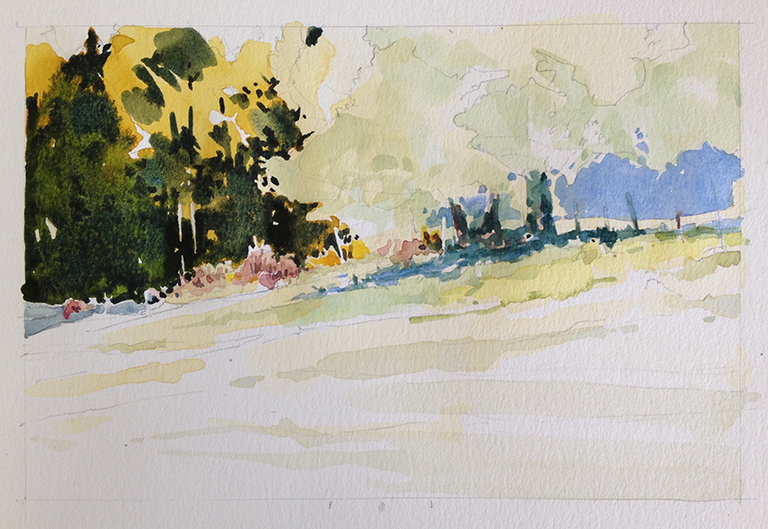 Plein-Air Sketching | Sketching … Always! 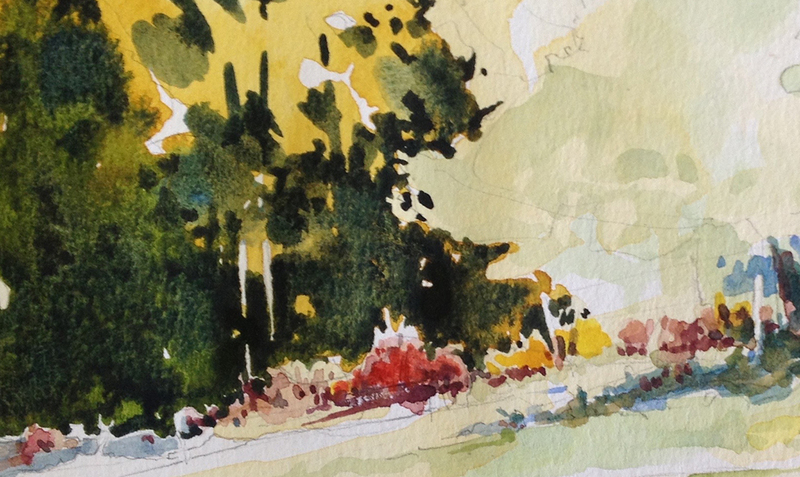 Working Westward to Chicago & the Urban Sketchers Symposium! Earlier this summer I was exploring sites just east of the Blue Ridge range. In old neighborhoods and part of towns that I seldom cross through much less actually see. I was also up on the the Blue Ridge, south of Afton Mountain, and back into the Shenandoah Valley. Meandering a bit, both northward and to the south, I kept finding old places I wanted to re-explore and new ones that tweaked my interest … everything from old walled cemeteries entrances to beautiful vistas viewed from between road signs. Wow! Three days of non-stop sketching, working with a few hundred other artists … all sketching in pencil, ink, and/or color! I think they may be part of my tribe!? The first two sketches I made, I kept them pretty low key and simple. One, the interior of F.L. Wright’s Unity Temple done with a fountain pen and a fountain brush pen. 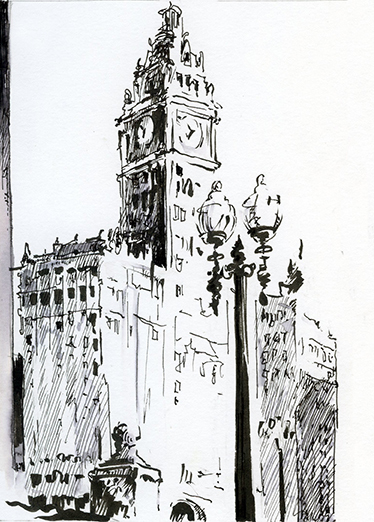 The second, of the “L” seen from Congress and Wabash, I started using a light, loose pencil underdrawing but quickly substituted the pen to continue the line work. As I neared completion of the lines, I began to use the pen to lay in areas of dark. 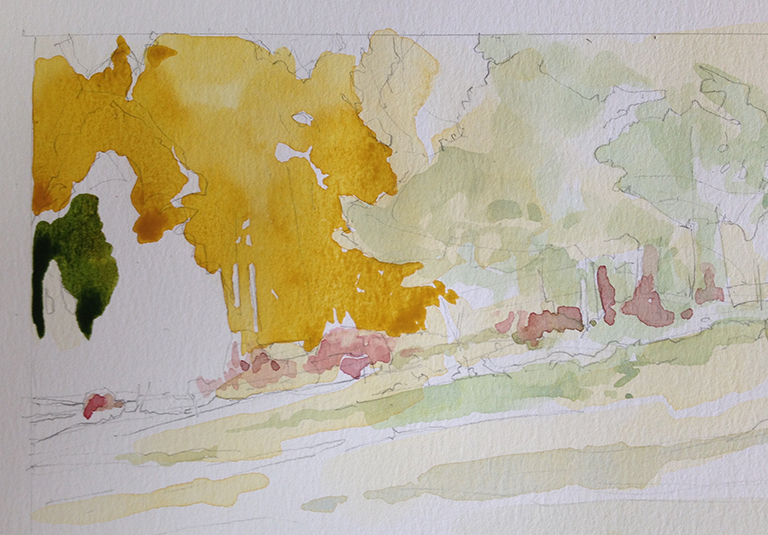 Before the ink could dry, I applied a wash to unify most of the linear elements into a cohesive whole. This wasn’t my only sketch of Chicago’s elevated train tracks, but I think it was one of the most successful. As the next three days progressed, I was constantly pushed and pulled by the workshop leaders and by the shear vertical scale of Chicago’s buildings in the central loop and at the lakeshore. The camaraderie was great; folks were intensely supportive too. The local Chicago chapter did a marvelous job as hosts as well. assisting all the 500+ participants in so many ways. 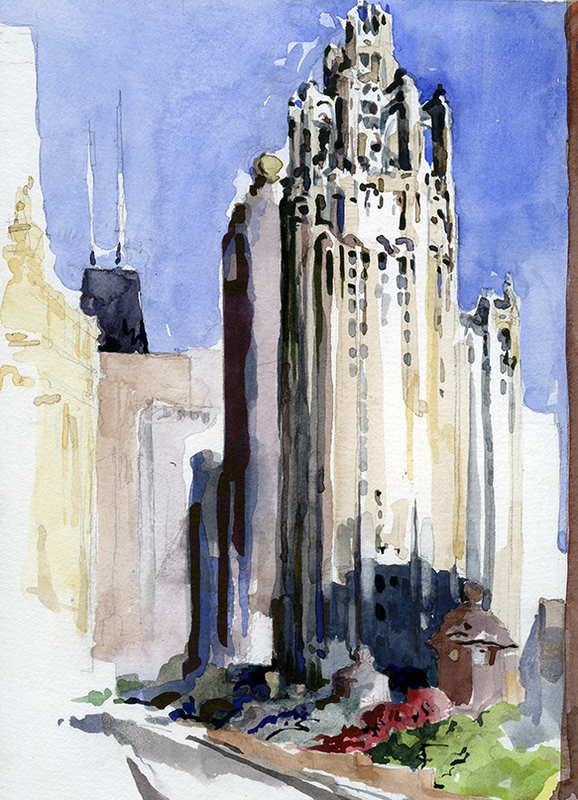 Well, I have to go do some work in the studio now; I will post a few of my more color rich Chicago sketches as well as some from the trip home pretty soon. We have lots of contrast based pairings in our verbal and visual vocabularies. In our heads … and in our popular culture … we use or hear a number of them pretty regularly. It is common for us to hear references to iron and velvet, leather and lace or fire and ice. Some of them are used as cultural icons, as trade or service marks, as well as tag lines in advertising, books, movies. We have stories within which we associate these pairing; we have truism that play over and over in our heads as soon as we hear them uttered. “Oil and water may not mix.” They convey a sort of tension, a tension that drives drama, fear, or even an ironic twist – all kinds of excitement. It even occurs in the world of art. In fact, I had a lovely conflicting duality that played out in my head for years. As many of you have figured out, I really enjoy many forms of mixed media … and I can also be a bit of a purist at times as well. 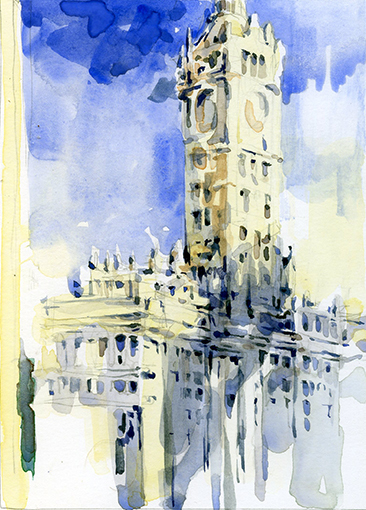 In the past I found myself thinking that using watercolor and ink together was too often the last resort of someone who could not make watercolor work without ink as a crutch. 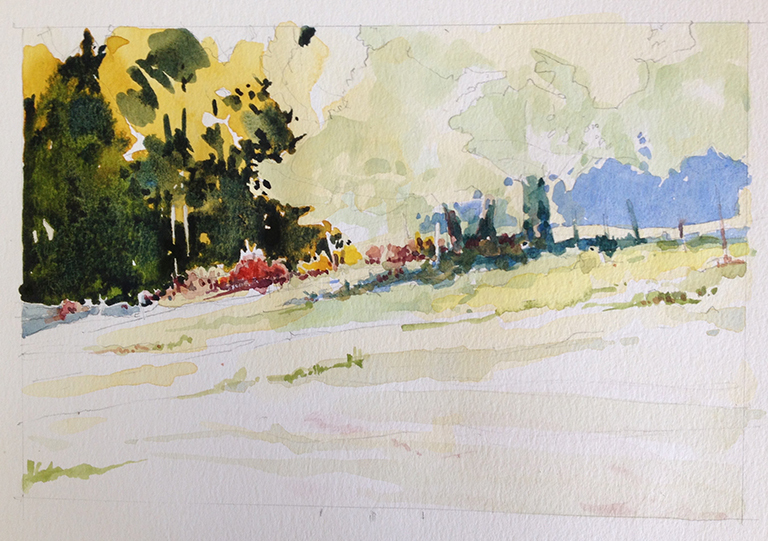 And I mused that an ink sketch or drawing really shouldn’t need some weak color washes to make it more appealing. We didn’t need to be in the business of gilding lilies. On the other hand, I LOVE mixed media. 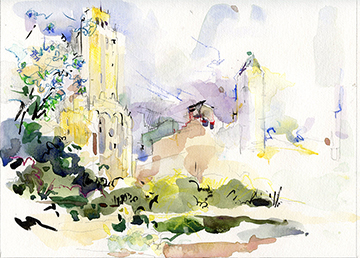 I have been exploring mixed media drawing and painting myself for over forty years and lately I have been doing a lot of aqueous and mixed media sketching outdoors. 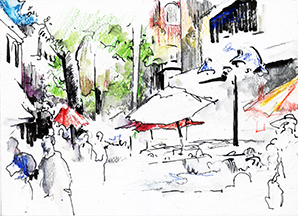 Somewhere along the continuum between urban sketching and plein-air, these sketch have usually been done with either watercolor or ink. The ink has been with fountain pens, Japanese style brush pens, as well as ink washes. 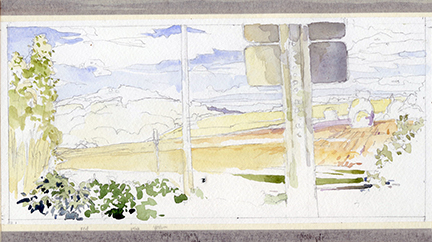 And, of course I continue to create watercolor sketches in monochromatic, limited palette, and even sometimes a full range of color. 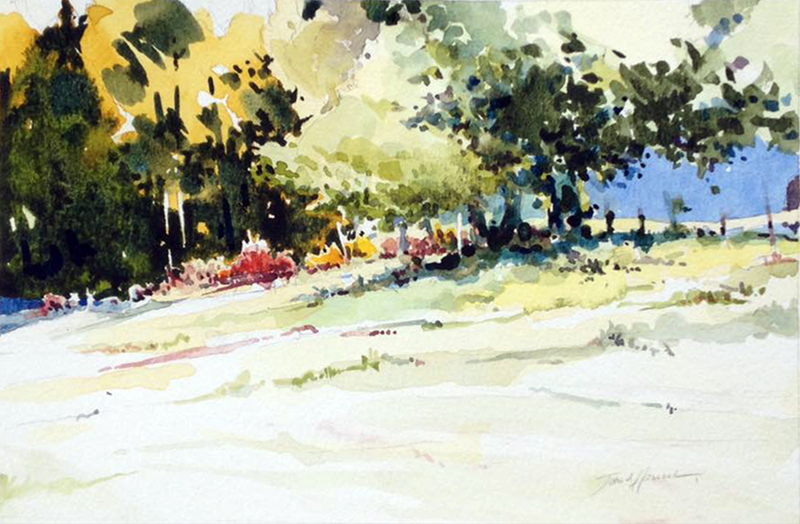 But quite a few have been fully hybrid pieces, straddling the line between watercolor and ink. So, YES, I have been using ink and watercolor together. Actually pretty frequently. 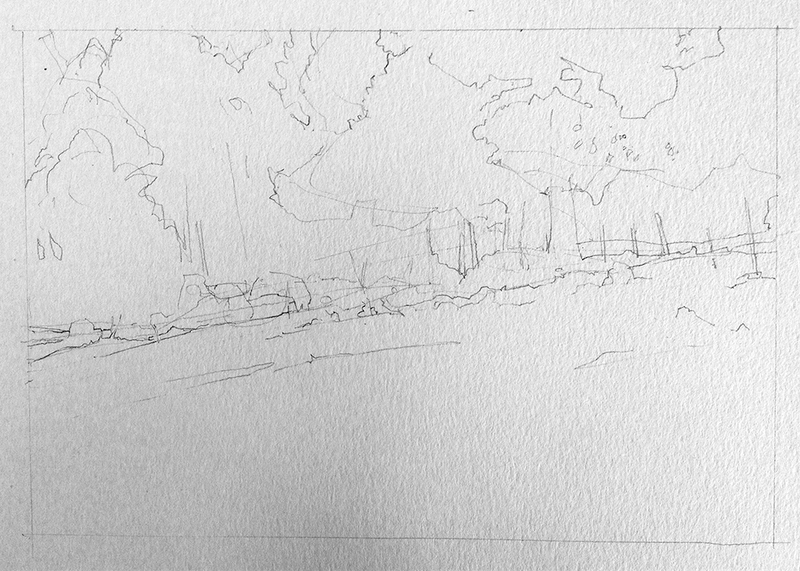 For this one I worked up a super loose set of pencil lines to get the visual movements I wanted in the piece and the barest indication of relative sizes and locations. 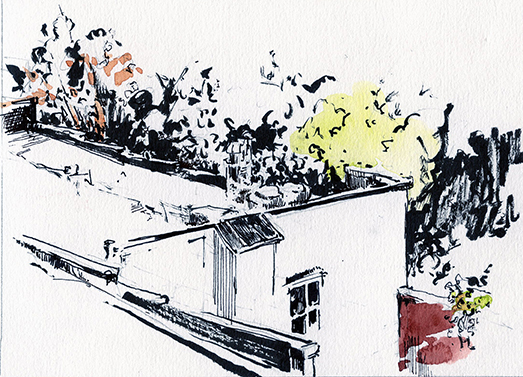 From there I quickly started laying in ink line in the upper right corner where sky, rooflines, and the chimney meet laid. Realizing that I was using a water-soluble ink, I stopped using my ink, got out a brush to put the lightest values of the middle areas of the paper. These were the hues of the sun lit portion of the building that I could see being the poles, trees, and bushes. Once those initial washes dried, I added addition ink lines and color layers pretty freely. I paid attention to what was dry and what remained wet so that everything didn’t run together. However, if you look, you can see that I did allow some mingling of ink and pigments. Now, my initial idea was to showcase the brightly lit space around the synagogue’s front steps seen through a gap in the dark foliage. As I worked on the sketch, I soon realized that my fairly high key colors were dominating the composition … and the darks were really nowhere to be found … except in the ink line work. 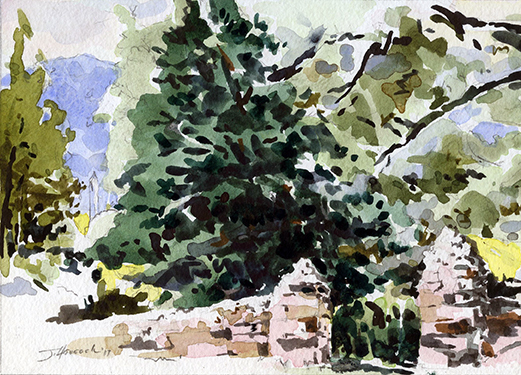 This one ended up being a relatively strange little sketch, an odd angle and odd vantage point … looking at a tree, hedge and bushes while focusing (but not to much) on the color of sunlight on the bricks and steps that are just visible between/behind them all. Here are two others, both from yesterday, that combining multiple materials. 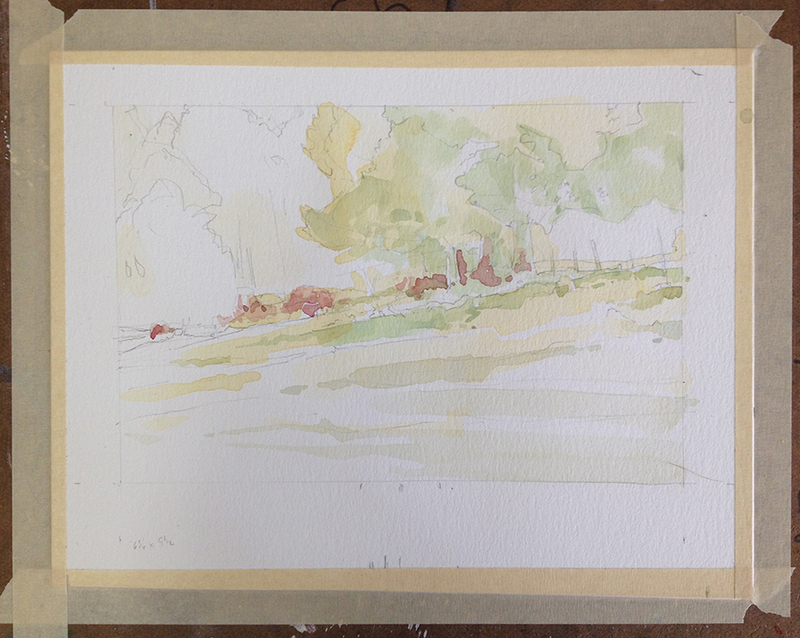 I was working with one of my sketching classes and, once I got them started, I made quick little pieces. The first includes watercolor (Caran d’Ache watercolor leads) and ink (both fountain pen & brush pen). The second one, below, is just a detail of an unfinished sketch combining water-soluble graphite and ink (again my ink brush pen). As you can see, my tendency to be a purist is only partially evident. 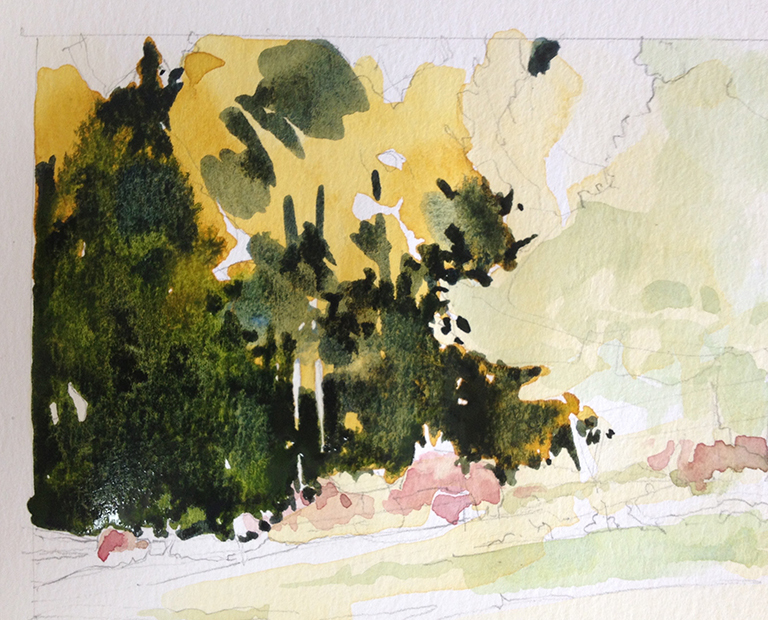 In practice, the duality … the dichotomy over combining watercolor and ink in my head leans towards the inclusivity. 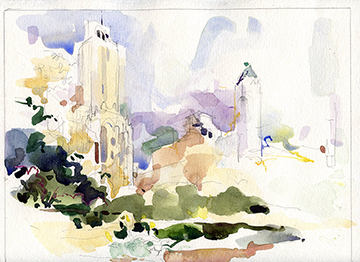 PS These are probably the last two sketches I will be getting in before I head to Chicago later this week to participate in the Urban Sketcher’s International Symposium. I do hope to post about that experience… maybe even from Chicago itself. I am a wee bit excited!